Recently on an online community, a photo of Kim Soo Hyun with the title of “Someone snapped the side view photo of Kim Soo Hyun” was posted. In the photo, Kim Soo Hyun looked nonchalant and ignored the camera as if been photographed by other people. 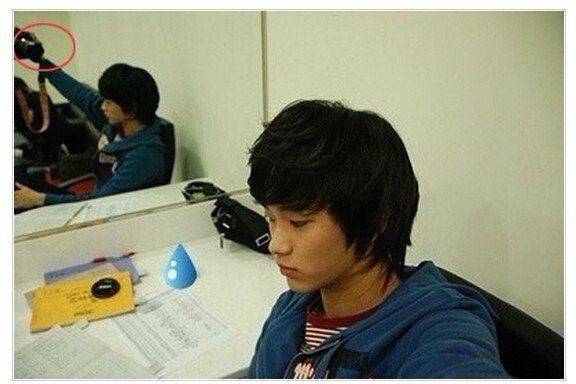 However, what’s reflected in the mirror revealed that Kim Soo Hyun was taking a selca (self captured photo). In the mirror, Kim Soo Hyun was stretching his arm, holding a camera to shoot himself. Netizens commented, “The indifferent look Kim Soo Hyun is so cute,” “Seems like doesn’t know about the mirror,” “How embarrassing,” “So adorable, pretending to ignore the camera,” and so on. Meanwhile, Kim Soo Hyun is starring in hit drama The Moon Embracing the Sun.